River Ganseys – Striking t’loop, Swaving, and other Yorkshire Curiosities Revived From the Archives is out on Ravelry. Your actual hard copies will hopefully be ready for Rhinebeck (The New York State Sheep & Wool Festival). The rather wonderful Schoolhouse Press will be stocking the book. That makes me happy on so many levels. Most especially because Elizabeth Zimmermann was always and always will be my favourite knitting writer. In River Ganseys I tried to stay with EZ’s philosophy of giving the reader the tools to go out and create, themselves, using the broad principles and motif charts in the book, if they don’t want to knit the patterns. River gansey knitting was always like this anyway; patterns all kept “in the head”, every individual knitter finding their own constellation of motifs and ideas, and going with them. Those of us in the UK; ask your friendly local yarn shop or trader of choice to get on the Cooperative Press website and order copies in. 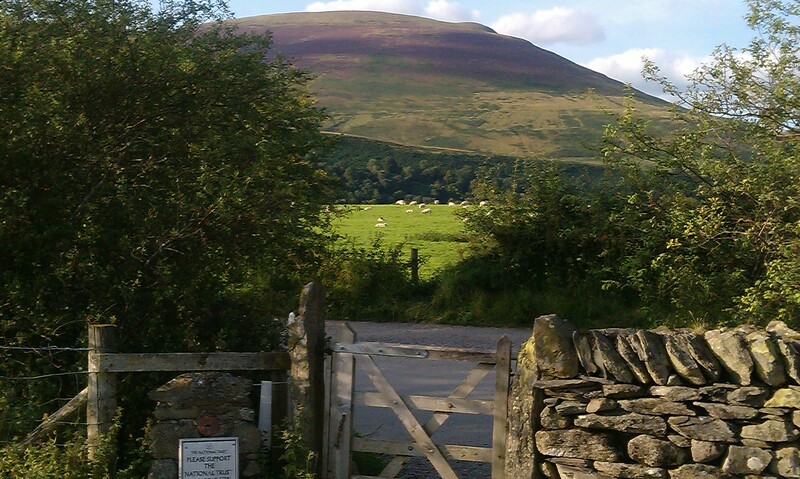 There may or may not be copies available at the Bakewell Wool Gathering – depending on how soon the printed copies arrive – but The Old Hand-Knitters of the Dales is definitely still available from Freyalyn’s Fibres, who will be at Bakewell. 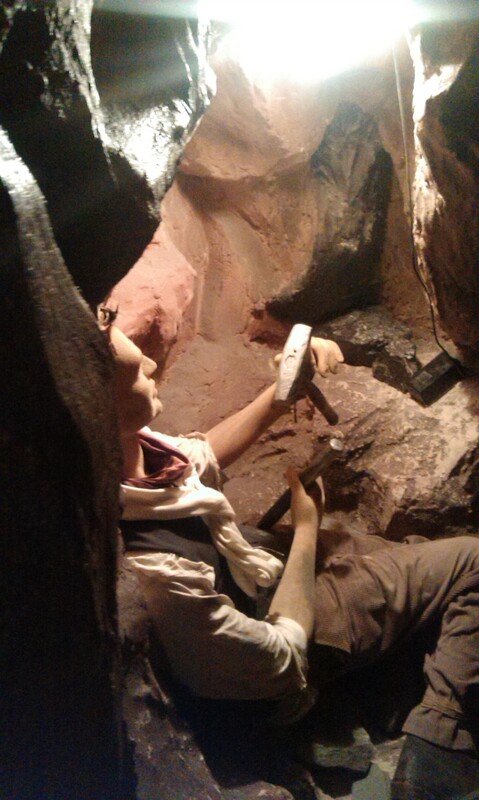 We’ll be there too but not with our Great Wheel or Luddites show – just wandering around. It’s weird for me not to be dressed as a Georgian woman, doing these kind of things, these days! 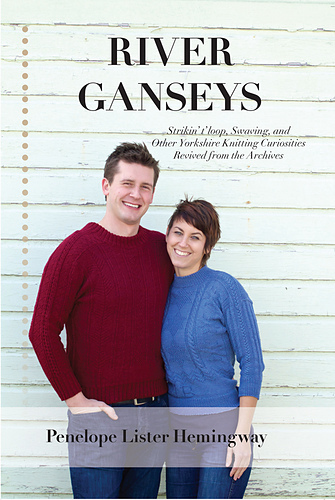 River Ganseys could have been a parochial book by its very nature; concentrating on the history of Yorkshire knitting. But the story that emerged, as I researched, was of a kind of universality – this history is every knitter’s history; a shared history. One reason I started this blog was so that people would know I was still alive whilst I was working on the book. 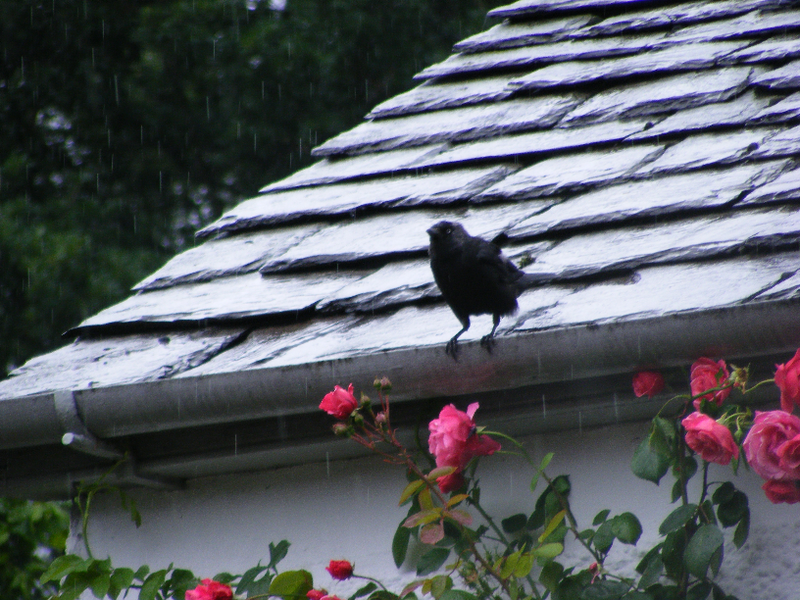 So I hope you loyal-and-rather-brilliant-if-I-say-it-myself blog readers, will enjoy. Many of the comments, emails and messages on Ravelry sparked by discussion here, helped with developing the book. Not textiles, but colour related so I thought this would interest some of yous. 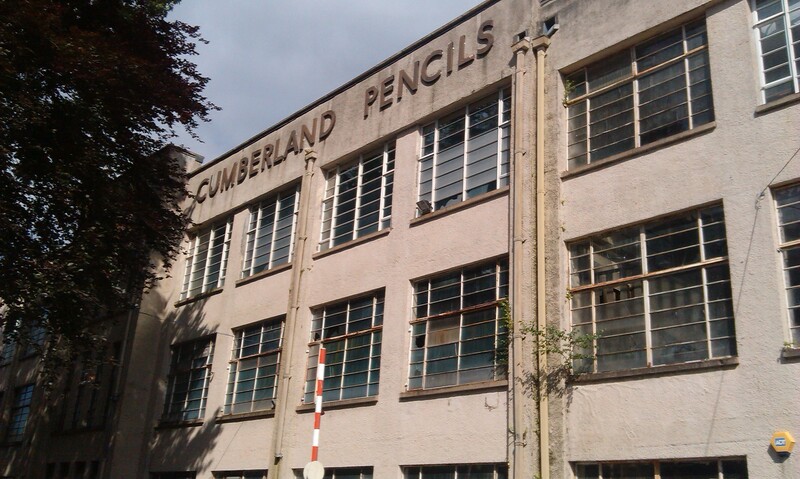 The old Cumberland pencil factory, Keswick. 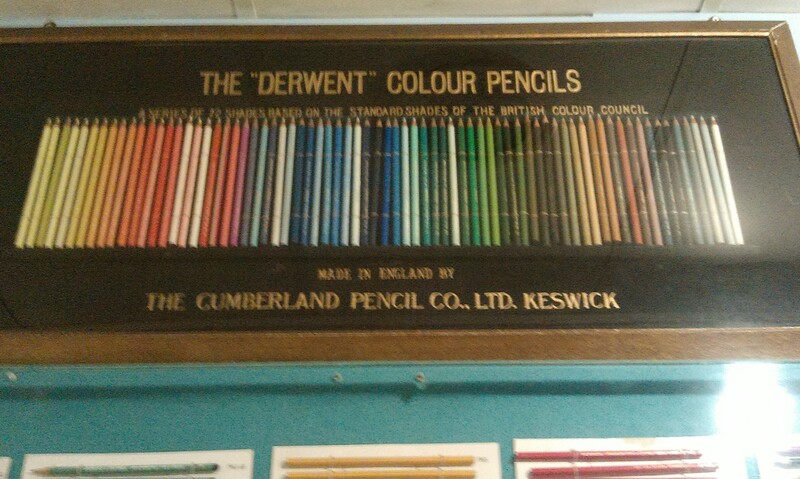 Yesterday we went to the Pencil Museum in Keswick. (I know how to have a good time). The museum is a former canteen, standing in the grounds of the now empty, old Cumberland Pencils factory. It would make a brilliant set for a re-make of ‘I’m Alright Jack’ or ‘Saturday Night, Sunday Morning’. Production has moved to Workington now, so the pencils are still from Cumbria. The story is that it all started in 16thC Borrowdale during a violent storm where an old tree was uprooted; amongst its roots were shards of graphite. 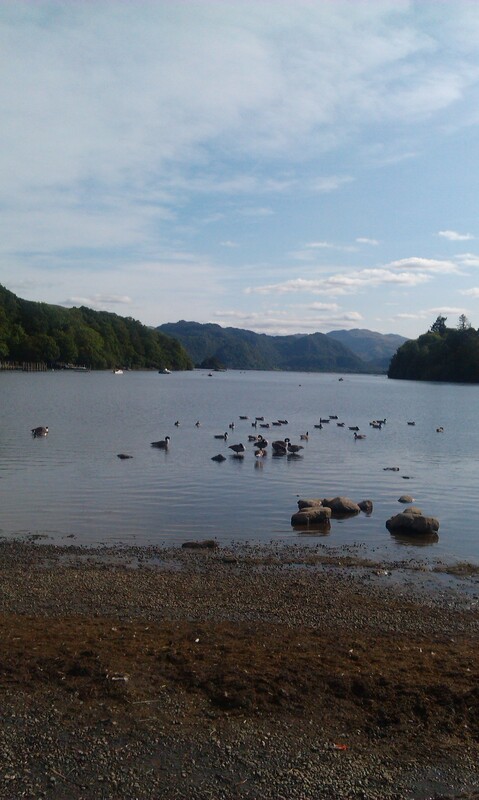 I’ve always wanted to see Derwentwater – remembering the pictures on the pencil tins we had at school in the 1960s and 70s. Some weird nostalgia gets hold of me when I think of those pencil tins with the ‘Lakeland’ logo and picture of Derwentwater on the front. 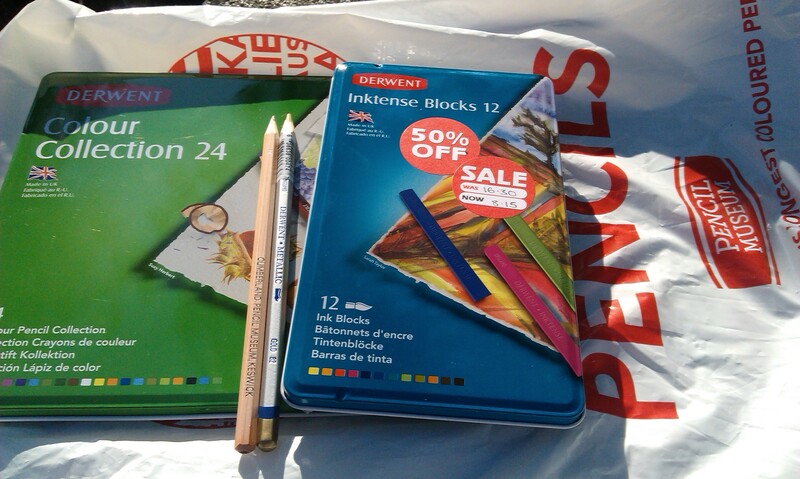 Am sure I never had those pencils at home, where I probably had the ‘Happy Shopper’ equivalent. But at school, getting those tins out of the cupboard was always a happy sort of thing. Maybe less to do, at the time, with the colours and more to do with the fact ‘colouring in’ was easier than actual work. I also have fond memories of the endless paint boxes I had at home; thinking about it, my interest in colour (and old, pretty tins which I have accumulated for a lifetime) probably started there. Many textile artists like to play with colour, and it is easier to experiment with watercolours or coloured pencils, than it is to mess with fabric or yarn. People had been telling me forever “You have to go to the Pencil Museum. You’d love it!” Not sure how to take that really but anyway, we were up in Cumbria for something in the morning and thought we’d spend the rest of the day at Keswick, as we’d spent out on petrol to get up there, anyway. 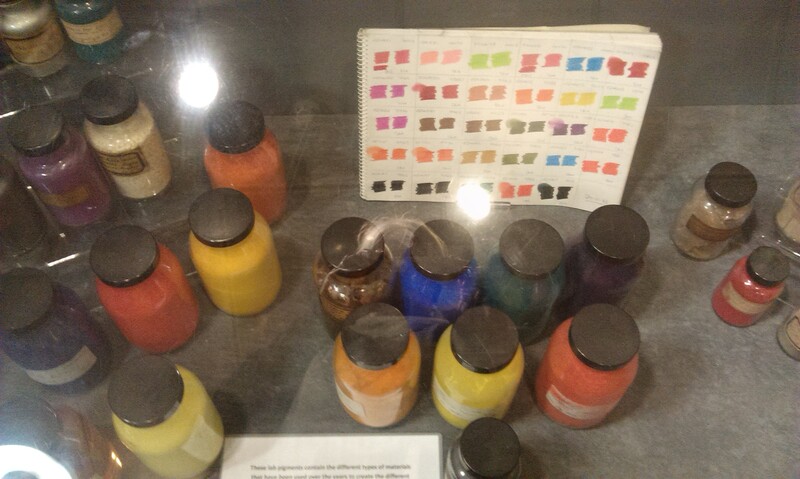 When we got in there, there were so many lovely things – I thought those of you who love pigments, dyes and colour in all its forms, might enjoy this. The museum is small but very interesting. And that pencilly smell hit us as we went through the door – the same smell you got as a kid at primary school when you were the honoured one who was allowed to open The New Pencil Tin. The first Keswick pencil factory was opened in 1832. The Museum has a couple of pencils dating to the early 1830s which must have used natural (mainly mineral?) pigments. 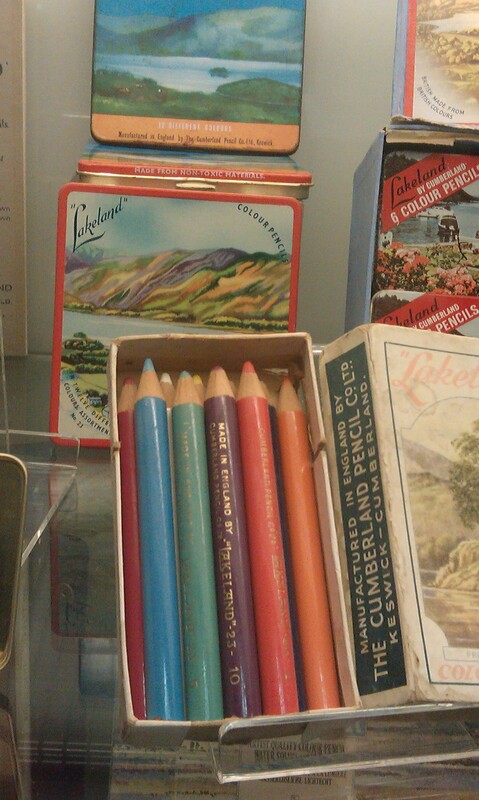 The familiar ‘Lakeland’ pencils weren’t developed until nearly 100 years later. Pencils were originally graphite (which occurs naturally in Borrowdale). Coloured pencils were a later development, when pigments (first natural, later synthetic) were combined with binding agents and wax or oil. 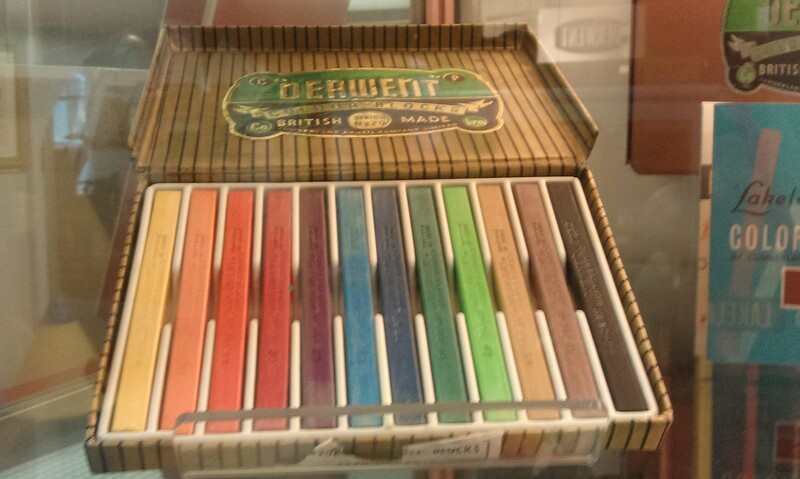 Derwent pencils are wax based. Artists’ coloured pencils have higher concentrations of pigment, and are now extensively tested for light-fastness – how fast pigments lose their “colour integrity” – and are graded accordingly. The concept of fugitive colour is nothing new to dyers. Trial, error and experience have told many of us that x natural dye is more fugitive than y. There was an interesting video about a James Bond style top secret wartime mission to create a pencil containing a hidden compass and map for RAF servicemen and how the company have made a modern repro – not an easy task as it turned out, as the ‘secret pencils’ were made at night, and no records kept of precisely how it was done. I might have accidentally bought a couple of things in the Museum shop where the majority of items seemed to be very well discounted and as a result, I will be back! Colours in nature are sometimes the best inspiration for textile and other art work and your tourist-y photos can also become great references and sources of inspiration. 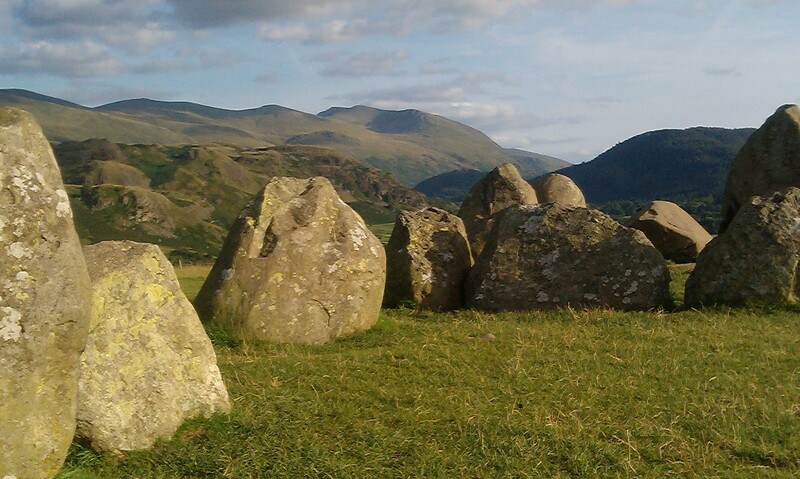 We finished the day at nearby Castlerigg stone circle. We visit this after every Woolfest. 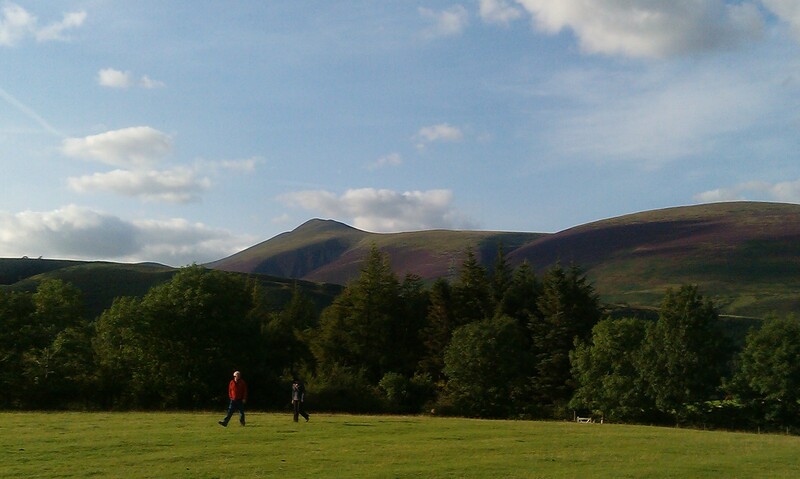 I have never seen the Lakes this time of year with the heather on the hillsides. It is so beautiful, I’ll return soon.